Kickoff set for 7 p.m. Saturday on ESPN. LATEST LINE: Huskies are favored by 5. Myles Bryant, the Huskies’ 5-foot-8 junior nickelback, has been one of UW’s most productive players on defense so far, posting 13 tackles, one sack and two pass break-ups through the first two games. He figures to have his hands full Saturday night against Utah’s 5-foot-8 slot receiver Britain Covey, who has 15 catches for 208 yards in Utah’s 2-0 start. Bryant said Covey presents similar challenges as UW slot receiver Chico McClatcher. “They give him the ball in space and just let him work,” Bryant said of Covey, who also returns punts for the Utes. Washington has prided itself in recent years on its elite secondary. Utah’s might be just as good. 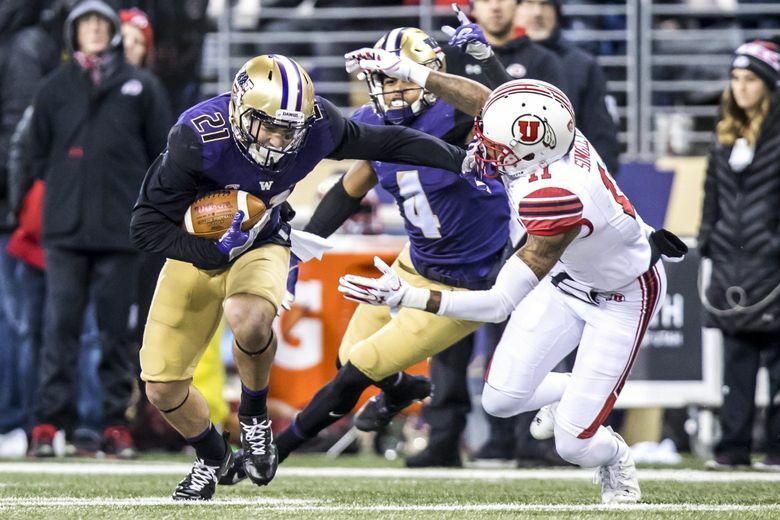 The Huskies boast two potential high NFL draft picks in their secondary in Byron Murphy and Taylor Rapp, and the Utes counter with one of their own in Julian Blackmon, a 6-foot-1 cornerback from Layton High outside Salt Lake City. The Utes also have two veteran starters at safety in Corrion Ballard and Marquise Blair. Through two games, Utah leads the Pac-12 in allowing just 62.0 passing yards per game and no touchdown passes (in wins over Weber State and Northern Illinois). JUDE’S PREDICTION: Huskies 23, Utah 16. —ESPN’s broadcast team for the game is Steve Levy (play-by-play), Brian Griese (analyst) and Todd McShay (sidelines), the same crew that did UW’s opener against Auburn. The broadcast can also be found on WatchESPN.com. — The UW broadcast of the game will also air on Sirius (146) and XM (382) satellite radio, and is also available via TuneIn.com and the TuneIn app. — The Pac-12 Networks’ new on-campus show, “The Pregame,” will air from Salt Lake City on Saturday, broadcasting live starting at 10 a.m. PT. Mike Yam hosts the show alongside analysts Evan Moore and Nigel Burton, the former Husky. — Saturday’s game marks the first time Utah and Washington have opened their Pac-12 seasons against each other. — Washington leads the series with Utah 10-1, including a 2-0 mark in Salt Lake City (2011, 2016). Utah’s win was in Seattle in 2015. Utah is 1-4 against UW in conference games. — Utah is 0-3 against ranked Washington teams, losing to the No. 14 (1979), No. 4 (2016) and No. 16 (2017) Huskies. — Against AP ranked opponents, Utah is 6-14 in the Pac-12 era, 19-25 since 1994 and 21-64 all-time. — There have been 52-consecutive sellouts in Rice-Eccles Stadium dating back to the 2010 season opener, including 49 standing room-only crowds.